Bedford, MA (May 27, 2016) – A group of Peabody Properties, Inc. employees, who dubbed themselves “Team Steps for our Vets”, were among the 150 walkers and wheelchair users — including community members, veterans and Veterans Affairs employees — who participated in the sixth annual VA2K Walk and Roll. The 1.2 mile walk, held at various locations across the country, raises funds and awareness for homeless veterans. 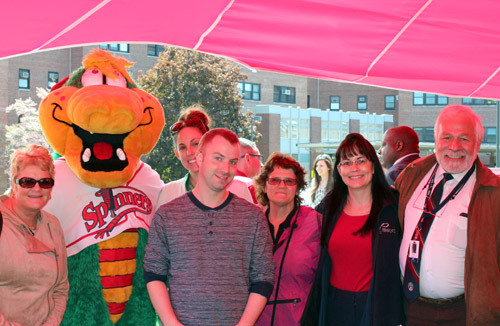 This year’s Massachusetts walk was held on the Edith Nourse Rogers Memorial Veterans Hospital campus in Bedford. Donations raised will support homeless veterans moving into the nearly completed Bedford Green Apartments. Managed by Peabody Properties, – a full-service real estate firm based in Braintree, Massachusetts – Bedford Green Apartments is a furnished, supportive housing community for formerly homeless and at-risk veterans, ages 55 and older. Featuring 69 residences, Bedford Green is scheduled for completion later this summer. According to Morgan McDonagh, Peabody Properties Operations and Technical Support Manager and Wellness Subcommittee Co-Chair, the VA2K is a great way for employees to support veterans, get exercise and promote health and wellness. “We’re proud to participate in such a great event that provides much needed support for our local veterans,” said McDonagh. Pictured above (left to right): Maureen McKeown, Peabody Properties Compliance Manager ; Lowell Spinners Mascot Canaligator; Morgan McDonagh, Peabody Properties Operations and Technical Support Manager; Kyle Wholey, Peabody Properties Administrative Assistant; Doreen Donovan, Peabody Properties Vice President of Administration and Quality Assurance; Joan Lyman, Peabody Properties Regional Resident Service Coordinator; and, Neil Difazio, Peabody Properties Property Manager at Pleasant Street Apartments. Peabody Properties, Inc. (PPI) Participates in GBREB Foundation Scholarship Fund Leadership BreakfastWarwick Resident Named Vice President of Human Resources at Peabody Properties, Inc.